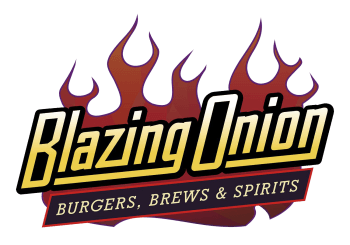 The Blazing Onion began as an idea that fast food could be good food. Burgers are America’s favorite food – why is it so difficult to get a fresh-broiled burger with quality ingredients, in a warm and relaxing atmosphere – without going to an expensive full service restaurant? So with that thought in mind, we combined the best elements of quick service with casual dining and developed a fast-casual restaurant with a full service attitude. Our menu features over 25 unique gourmet burgers including a meatloaf burger, a buffalo burger, and a wild boar burger. Do you have a favorite burger combination, it’s probably on the menu. We insist on high-quality ingredients such as Tillamook cheese, thick-cut peppered bacon, homemade burger sauces, locally baked buns, fresh produce, and ALL Natural ground chuck. For a healthier option substitute our ground chuck for a fresh chicken breast, our house made turkey patty, or a Santa Fe vegetarian patty.We press each burger patty in house from fresh-never frozen, ALL Natural (meaning – no anti-biotics, no hormones, vegetarian fed), 100% ground chuck from Painted Hills. It’s literally a mouth full. We top each of our gourmet burgers with our own top secret signature burger seasoning and serve them on locally baked buns that don’t fall apart when confronted with lots of juicy sauces. Of course we’re not just about great burgers, check out the full menu. In the restaurant, ordering at the front counter allows us to get your food on the grill right away, but it doesn’t mean that service is over. After you select a table, you can relax knowing that we do fast casual different than most. Our entire staff is responsible to help you have a wonderful dining experience. If you need anything, use the ’Service Alert’ sign on the table. We call it “Service on Demand”. We’ll be there in 30 seconds. No more looking for and waiting for a server. Of course don’t forget our full-service sports lounge. Either way, restaurant or lounge, we’ll take care of you. In the lounge you will experience full service from the beginning. Our culture of teamwork sets us apart. The lounge has HD TV's at every head turn, so you'll instantly appreciate that you can come in to watch the big game or games. Even so, most evenings you'll find yourself enjoying great food and drinks while visiting & laughing with friends.